Welcome to Michael Watson Designs, giving you up to date information on our products and services. T1025 22mm black. This is a tricot lined 3 layer tape with a generous low melt adhesive that can be laundered to 60 degrees C.
T3040-120-20mm. This seam sealing tape is designed for 2 layer fabrics with PU coatings and offers a strong non adhesive bond. We stock the 120 micron thick film, however a wide range of thicknesses are available. In 200m rolls. We now stock 2 popular tapes from San Chemical’s Melco range. Based in Osaka Japan they have a reputation for outstanding quality and performance. TQ2200 20mm black. This is a relatively new tape in the range performs well over a wide range of coatings and membranes. A tricot backed 3 layer tape in 100m rolls. It is dry cleanable. FU-700 20mm. This is an adhesive backed 2 layer tape for all PU coated fabrics. In 100m rolls. It can be run fast and clean and is quite thin to minimise tram tracks on the outside of the garment. Through our newsletters we hope to showcase one of our mills or suppliers, to give you a little background and summary of their products, services and competencies. 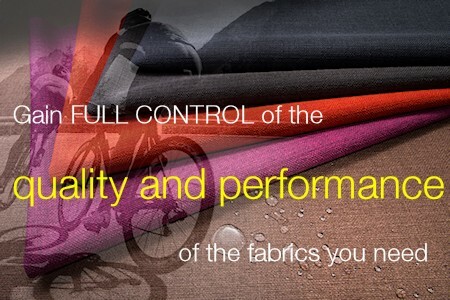 Masuda is a huge wholesaler of technical and functional Japanese fabrics headquartered in Osaka Japan. We can offer Masuda fabrics through Marubeni Intex. The range includes Waterproof breathable fabrics, 2, 2.5 and 3 layer fabrics for waterproof clothing manufacture, down proof fabrics stretch fabrics, ripstops taslans. Tussahs and a wide range of functional fashion fabrics. The advantage we offer is fabric minimums are 1 roll per colour with a 3 roll order minimum.